It must be Team New Zealand Black Match Racing and skipper Adam Minoprio's year. The excitement was on their yacht as the winds stilled for them to completely outclass and out-manoeuvre Ben Ainslie and Team Origin to clinch the 2009 Monsoon Cup at the Ri-Yaz Heritage Marina Resort & Spa in Pulau Duyong today. It was a grand double for the Kiwis who yesterday were crowned the 2009 ISAF Match Racing World Champion after closest competitor Torvar Mirksy and the Mirsky Racing Team failed to make it to the semi-finals. Incidentally, the Monsoon Cup was where Minoprio made his debut in the competitive World Match Racing Tour events. Minoprio hailed the win as the best race he ever had on the World Match Racing Tour as they won three straight matches over Team Origin to lift the Monsoon Cup. “We had struggled in the round-robin but in the final today we were in our element with this comprehensive victory,” the 24-year-old ISAF Match Racing World Champion said. “Perhaps getting into the knockout stages is a good omen for us. We are really, really happy with this win,” he added. For their effort Black Match Racing pocketed RM360,000, while Team Origin received RM250,000 and third placed YANMAR Racing with Dato’ Peter Gilmour as skipper earned RM150,000. 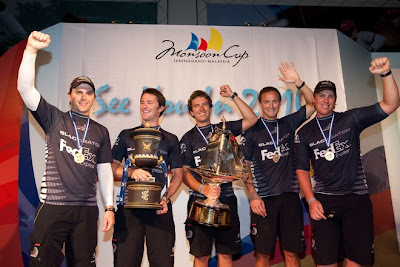 Gilmour had won the Monsoon Cup for the second time in 2008. Ainslie said he was disappointed and the team did not do anything right, but praised Minoprio and his crew for their splendid effort. Earlier, Minister of Youth and Sports Datuk Ahmad Shabery Cheek ignited the flare to signal the start of the final. In the first flight, Minoprio was over early. He then rounded the first top mark 17 seconds ahead of Ainslie. He was first to the bottom mark and headed left while Ainslie splits to the right. Then Minoprio gybed right on Ainslie’s line as they approach the finish – Minoprio was well ahead, but he was not taking any chances and won the race to take a 1-0 lead. In the second flight there were two protests in the pre-start between Ainslie and Minoprio and both were green flagged. Minoprio was leading Ainslie across the line. Ainslie was forced to tack off to the right. Minoprio then went left and he looks to be moving fast. Ainslie tacked into some good current and was now on line for the windward mark, but Minoprio came rocketing across from left-field and rounded the first top mark 15 seconds ahead of Ainslie. Minoprio had two knots of speed over Ainslie as he rounded the windward mark almost a minute ahead to register another win for a 2-0 lead. In the third flight, Ainslie won the start and headed left and Minoprio took his chance on the right. As they converge Minoprio rounded the top mark first – barely ahead of Ainslie. At this stage Ainslie was challenging and Minoprio defending. Ainslie sailing fast, positioned himself to block Minoprio’s breeze but Minoprio was able to squeeze around the bottom mark first, and decided to go left. Ainslie followed. Minoprio had a healthy lead by rounding the top mark 33 seconds ahead of Ainslie, as they finished their second out of three laps. Minoprio had a massive lead on Ainslie on their last upwind leg and won handsomely. Minoprio also added that 'had never seen better effort” from his crew. “This win is not all about me but my team. It is all about teamwork and how we harmonise our roles at a quick pace. We are going back to Kuala Lumpur shortly and it’s going to be ‘all night long party’ as we have planned a big celebration with our sponsors FEDEX, wives and girlfriends,” he said. 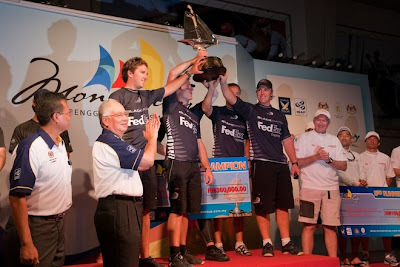 On the World Match Racing Tour, Minoprio’s win also ensured that Mirsky Racing Team finished runners-up on the World Match Racing Tour rankings. Ainslie is third and Gilmour fourth. Earlier, in the Petite final, Gilmour and YANMAR Racing defeated Col and French Match Racing Team 2-1 in the best-of-three challenge. “It was a good result for YANMAR, after taking the first flight we did not get it right in the second and came back strongly in the third. We are happy with our overall performance,” said Gilmour, the four-time world champion. On being crowned 2009 ISAF World Match Racing Tour Champion, Minoprio said he was very elated. Runner-up Torvar Mirsky said the result was beyond his expectation. 'Luckily the cancelation of the classification matches from fifth to eight spots did not affect our standing,” he said. Finishing third, Ainslie said it was a good result for him and the team. “We couldn’t have asked for better. 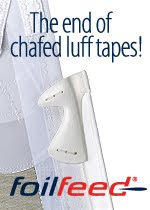 We take it,” he said.